It's spring on Sumas Mountain Farms and our gorgeous pigs are thrilled as the soil returns to life and the sunbeams begin warming the earth. Today as I was out on the pastures I took some pictures. It was a joy to watch the pigs play and run and dig in the soil. I also took some video of the pigs, which I hope you enjoy. 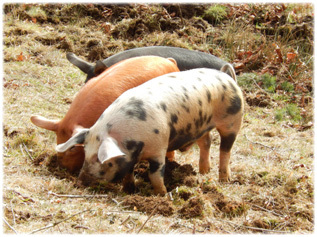 Watch as our pigs forage on grass, root for treasure, and enjoy life on the farm. As I've observed pigs in their natural environment it's become evident to me that they're fascinated by the earth. Yes, they've got noses which were designed as shovels --- they are biological plows. But more than that, they seem to have an invisible connection to the soil, and I think it goes beyond just wanting to dig for roots with their snouts. Even in very inclement weather, the pigs want to be outside. We have shelters for them, but they rarely choose to use them. They prefer to dig nests with their noses and connect with the dirt, and it doesn't seem to matter how cold or wet it gets. These pigs are just five months old. They're having a wonderful day connecting with the ground. I've often wondered if they're sensing something in the ground that we humans are unaware of. Recently I was reading Dr. Mercola's articles on "grounding" (you can read his interesting articles on the subject here and here) or "earthing" as it is sometimes called. It's the concept that living creatures (humans included) need to be electrically grounded to the earth in order to allow an abundant flow of free electrons to flood their bodies. The free electrons act as antioxidants, according to researchers. Because modern humans are insulated from this electrical transfer, due to plastic shoes and concrete surfaces, our health suffers. At least that's what some researchers are suggesting. If they're right, then maybe that's why pigs want to be in constant contact with the earth. Maybe they're enjoying this free-flow of antioxidants into their tissues. I realize this may sound a little strange to some folks, but I think if you were to observe my pigs for a few hours you'd notice an almost magnetic connection between the animals and the earth. Digging for treasures. Rooting for hidden delights. Reflecting on this, I considered the millions of conventional barn pigs raised on concrete floors, inside, on industrial farms. They can't dig nests, root with their snouts, or even taste a blade of grass. They never go outside. They are permanently disconnected from the ground. Together with the growth stimulants, pharmaceutical cocktails and ammonia-saturated air they breathe, I'm amazed that conventional barn-pigs even survive to slaughter. A fellow by the name of Drew Ramsey coauthored a book called The Happiness Diet. I've only just learned of the book. He writes about the myriad benefits of healthy fats from animals raised on pastures, and how their meat and fat is filled with important antioxidants. Conversely, he notes that confined animals tend to be deficient in B vitamins, zinc, iron, and other vital antioxidants, including vitamin D. Should this surprise anyone? There are probably dozens of reasons why pastured animals tend to produce healthier meat (and eggs) than confined animals. And now it turns out that "grounding" could also be a factor. According to Dr. Mercola's website, when humans allow their skin to come directly into contact with the earth, a great number of free electrons transfer from the earth directly into their bodies, making an electrical circuit of sorts. These free electrons are, he says, powerful antioxidants. The ideal locations to do this are places with the most conductivity. Like wet areas. Maybe that's why so many people like walking barefoot on the beach. And maybe it's also why my pigs seem to love bogs, aside from the fact they're delightfully cool. Advocates of this practice claim to have a dozen peer-reviewed studies to back up their claims. That's not very many, but the research is still young. One fascinating study which Dr. Mercola referenced involved rats. The results indicated that "grounded" rats had positive physiologic and metabolic changes compared to the control group. Could these results be extrapolated to other mammals? It will probably take years to definitively prove whether grounding is as necessary for health as some researchers claim it is. But I don't need any further proof, at least not as far as my pigs are concerned. I'm going to believe my pigs know what's best for them --- living outside, running and playing and lazing in the sunshine, and being in contact with the soil. One of the things I've noticed about our pork is the marvelous taste of it. Not too long ago as we were enjoying a pork roast, I remarked how similar to beef it tasted. The pigs are pasture-raised, and so it makes sense that their meat will reflect the grass and other forage they eat. Similarly, the pork chops are a real joy, particularly when they've been grilled. And as for the sausages and bacon, they are such a delicious and nourishing breakfast (especially alongside maple syrup and fresh organic soy-free eggs). Pork chops, tenderloin, roasts and ribs are now in stock. And remember, all of our pork is 100% soy-free. To our knowledge we are the only source of certified organic soy-free local pastured pork in the greater Vancouver area. We've removed the soy from their diet because we feel a soy-free diet is healthier for the pigs. Yes, it takes longer for the pigs to grow when soy is eliminated. And yes, it ends up costing us more. But to us, it's worth it. And we believe the pigs would agree. We're so grateful for our wonderful customers, who are willing to share our vision for healthy families, healthy animals, and a healthy planet. Thank you for supporting local, organic family farms.